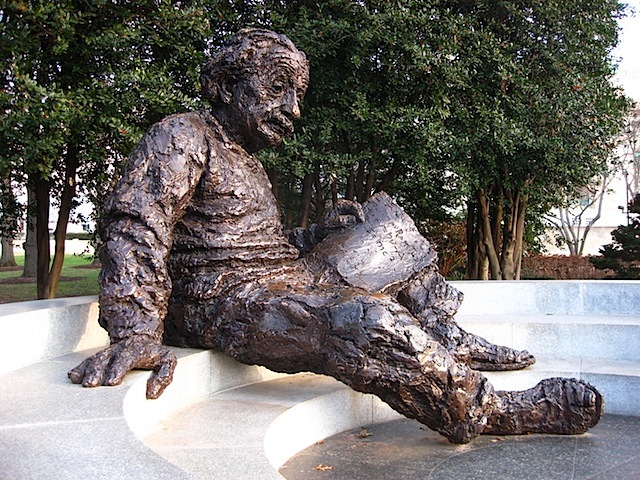 The Albert Einstein Memorial is a monumental bronze statue depicting Albert Einstein seated with manuscript papers in hand by sculptor Robert Berks. 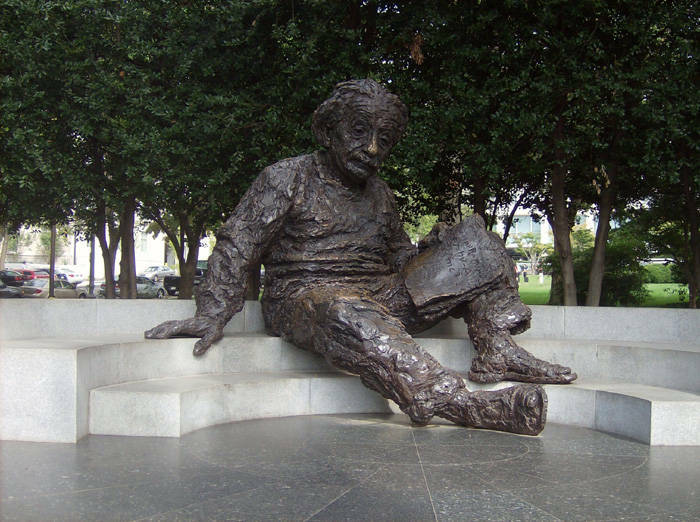 It is located in central Washington, D.C., United States, in a grove of trees at the southwest corner of the grounds of the National Academy of Sciences at 2101 Constitution Avenue N.W., near the Vietnam Veterans Memorial. 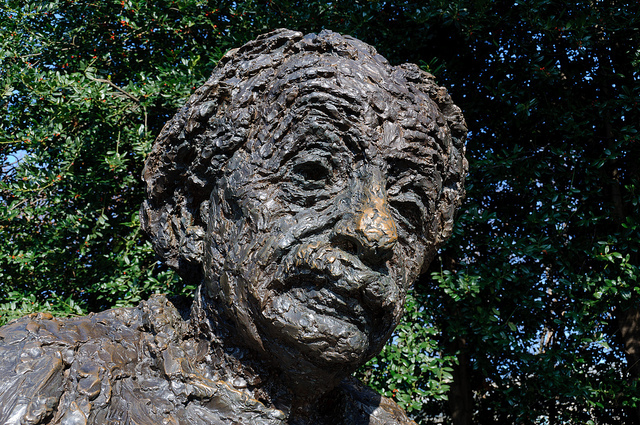 The memorial, situated in an elm and holly grove in the southwest corner of the grounds of the National Academy of Sciences, was unveiled at the Academy's annual meeting, April 22, 1979, in honor of the centennial of Einstein's birth. 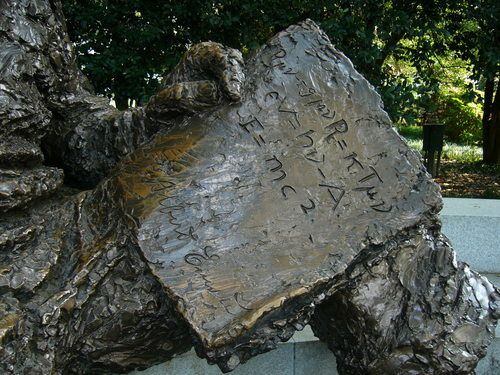 "a monument to the man who united space and time into space-time... a remembrance of the man who taught us... that the universe does not go on from everlasting to everlasting, but begins with a bang". The memorial is a popular spot for tourists visiting the national mall to pose for pictures. 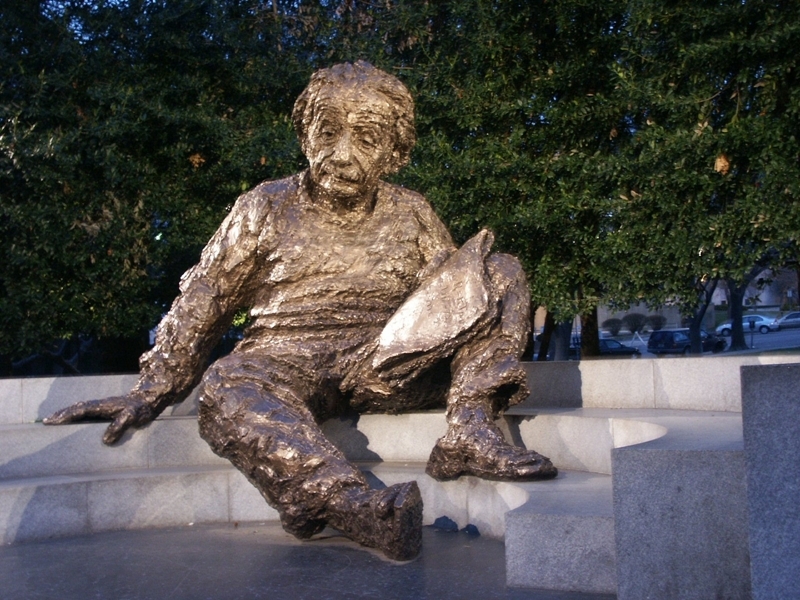 The statue depicts Einstein seated in casual repose on a three-step bench of Mount Airy (North Carolina) white granite. 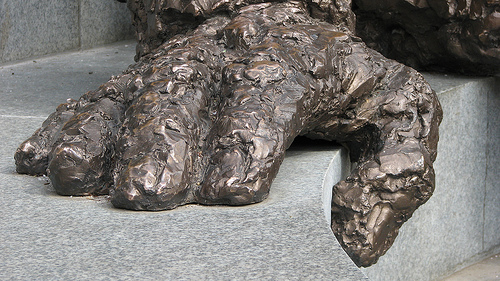 The bronze figure weighs approximately 4 tons and is 12 feet in height. The monument is supported by three caissons, totaling 135 tons, sunk in bedrock to a depth of 23 to 25 feet., It was cast at Modern Art Foundry, Astoria Queens, NY. 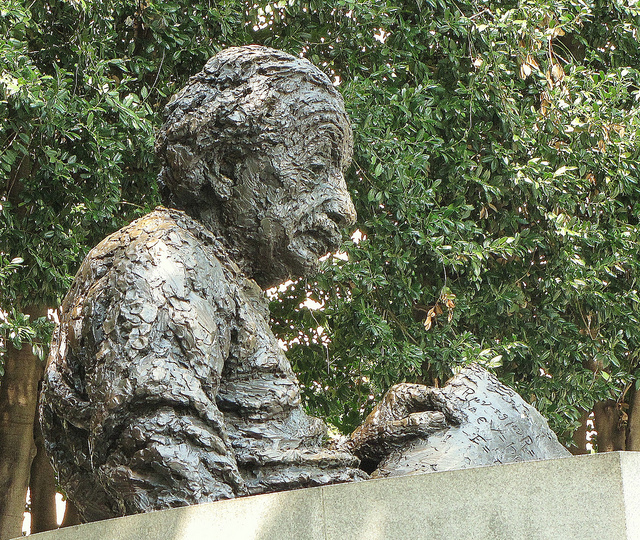 The sculptor, Robert Berks, known for his portrait busts and statues -John F. Kennedy at the Kennedy Center; Mary McLeod Bethune in Lincoln Park, Washington, D.C.-, based the work on a bust of Einstein he sculpted from life in 1953 at Einstein's Princeton home. Landscape architect James A. Van Sweden designed the monument landscaping. Berks created two replicas of his 1979 monument. 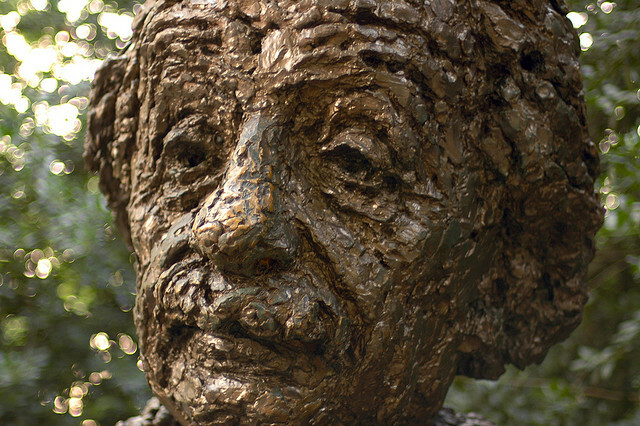 Today, the replicas can be viewed in the academy garden of the Israel Academy of Sciences and Humanities, and on the campus of the Georgia Institute of Technology in Atlanta, Georgia. he statue and bench are at one side of a circular dais, 28 feet (8.5 m) in diameter, made from emerald-pearl granite from Larvik, Norway. Embedded in the dais are more than 2,700 metal studs representing the location of astronomical objects, including the (sun, moon, planets, 4 asteroids, 5 galaxies, 10 quasars, and many stars) at noon on April 22, 1979, when the memorial was dedicated. The studs are different sizes to denote the apparent magnitude of the relevant object, and different studs denote binary stars, spectroscopic binaries, pulsars, globular clusters, open clusters, and quasars. Familiar constellations are marked on the map for easy identification. 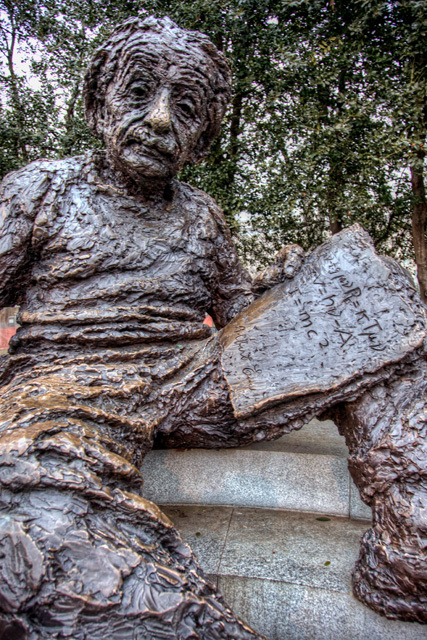 Along the back of the bench, behind the statue, three famous quotations from the scientist are inscribed. They were selected to reflect Einstein's sense of wonder, scientific integrity, and concern for social justice. ✓ "As long as I have any choice in the matter, I shall live only in a country where civil liberty, tolerance, and equality of all citizens before the law prevail". ✓ "Joy and amazement at the beauty and grandeur of this world of which man can just form a faint notion ..."
✓ "The right to search for truth implies also a duty; one must not conceal any part of what one has recognized to be true". 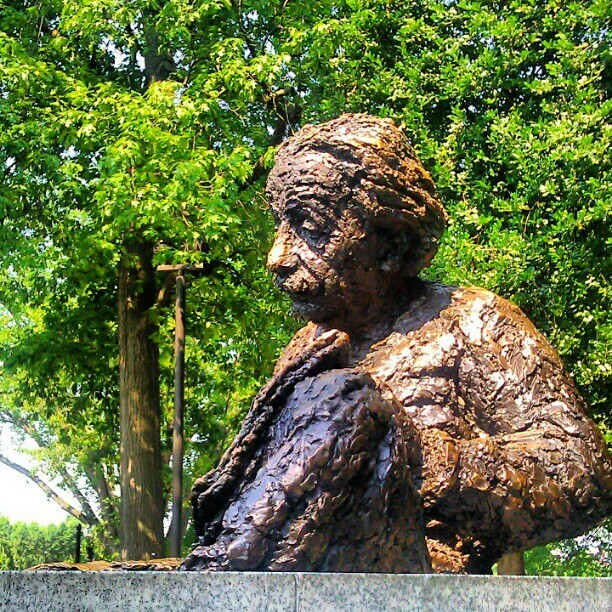 The Albert Einstein Memorial, situato nell'angolo sud-ovest della National Academy of Science sulla Constitution Avenue, vicino al Vietnam Veterans Memorial a Washington DC, città ricca di monumenti e memoriali. Venne presentato al meeting annuale dell'Accademia il 22 aprile 1979, in occasione del centenario della nascita del grande scienziato. Conosciuto da tutti come uno degli scienziati più influenti del mondo, Albert Einstein 1879-1955, il filosofo tedesco vincitore del Premio Nobel per la Fisica nel 1921, fisico teorico ed autore emigrato negli Stati Uniti nel 1933. La sua morte nel mese di aprile 1955 ha lasciato un segno nel resto del mondo, e ancora le sue teorie sono conosciuti a livello mondiale insieme con i suoi capelli in disordine e arguzia. 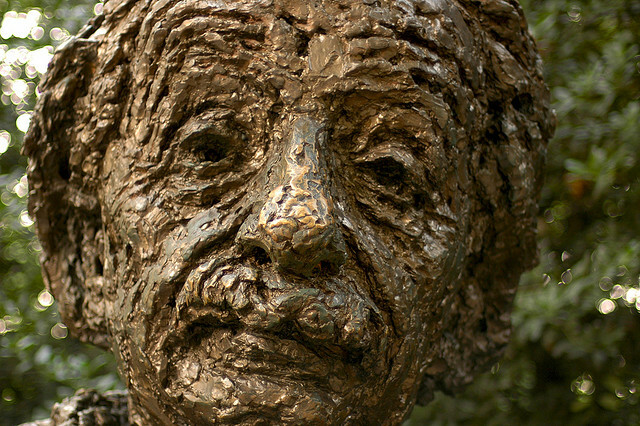 Einstein è stato eletto socio straniero della National Academy of Science nel 1922 ed è diventato membro nel 1942, due anni dopo è diventato un cittadino naturalizzato. 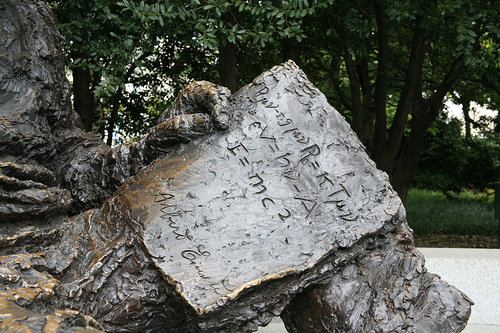 Einstein è raffigurato seduto su una panchina fatta di smeraldo perla. La scultura in bronzo, del peso di circa 4 tonnellate, è alta 12 metri. Tre cassoni, per un totale di 135 tonnellate, affondati nel substrato roccioso ad una profondità di 23 a 25 piedi, fanno da sostegno al monumento. ❍ Fino a quando non ho altra scelta in materia, io vivo solo in un paese dove la libertà civile, la tolleranza e l'uguaglianza di tutti i cittadini di fronte alla legge prevalere. ❍ Il diritto di cercare la verità implica anche un dovere, non si deve nascondere alcuna parte di ciò che si è riconosciuto per essere vero. 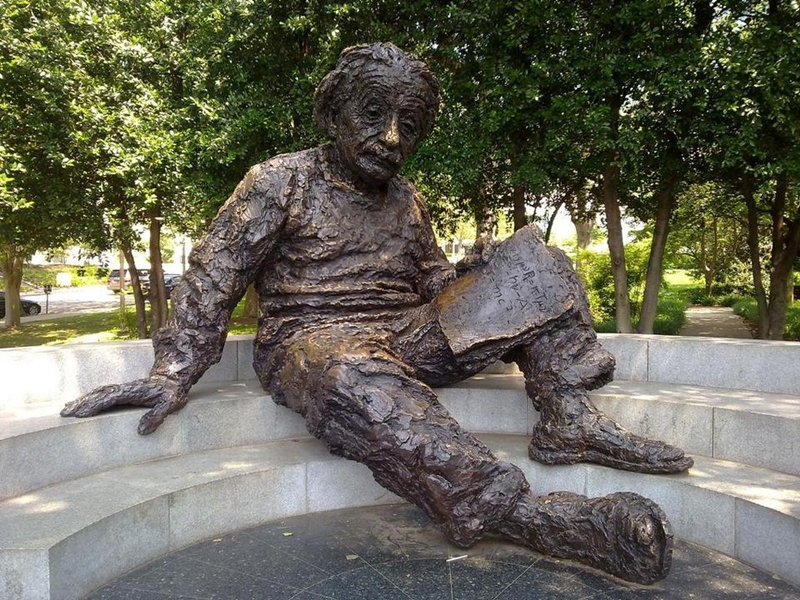 L'autore dell'Albert Einstein Memorial, è lo scultore Americano Berks Robert 1922-2011, noto per i suoi busti-ritratto, tra i quali il busto di John F Kennedy ad Washington Kennedy Center. L'Architetto paesaggista James A. Van Svezia ha progettato il paesaggio monumento.